Multicolor 3D printers have been around for a while, but most of these machines – like the Makerbot Replicator – suffer from alignment problems and the inability to mix colors on the fly. [RichRap] came up with an interesting solution to this problem by having three filament extruders feed into a single hot end, allowing him to change and mix colors on the fly. To print in multiple colors, [RichRap] developed a three-extruder x carriage that sends colored filament to a single hot end. Unlike the Makerbot Replicator, [Rich]’s extruder can mix and blend different colors into each layer of a print. The electronics portion of the build, [RichRap] controlled the X, Y, and Z axes of his printer with a RAMPS board, but used a slightly modified Sanguinololu board for the extruder motors. A single motor driver for the extruders is connected to a trio of toggle switches, allowing [RichRap] to switch between filaments on the fly. [Rich] has a very cool build on his hands, but it’s far from a perfect solution. Right now, any one of the three colors can be used to print, but printing with two or three colors simultaneously requires a change in the firmware. We expect someone to solve this problem in the near future, allowing the holy grail of a CMYK print head to come to fruition. You can see a demo video of [RichRap]’s tri-color print head after the break. [Adrian Bowyer] just posted his progress with multicolored printing to the RepRap blog. The new developments are a continuation of [Adrian]’s experiments with a mixer extruder that squirts four different colored filaments out of the same nozzle. [Myles Corbett] took this idea and ran with it producing the two-color print seen above. To squirt two different colored filaments out of the nozzle, [Myles] used two Bowden extruders mounted near the apex of the RepRap with tubes leading to the nozzle. Right now, the color of a print is controlled by loosening the grip screws of the extruder, but there are plans for moving that task over to electronic control of the extruders. While it may be only black and white now, it’ll be a very interesting development once five extruders are loaded up with cyan, magenta, yellow, black, and white filament. 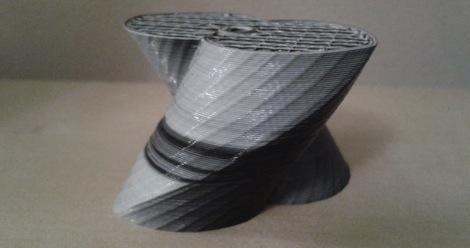 Yes, it is now theoretically possible to print full-color 3D objects on a RepRap. While we’re not looking forward towards having to upgrade our one-motor extruder to a four- or five-motor model, the possibilities for desktop fabrication are becoming amazing.